Recently I picked up a book I first read in fifth grade. It was a book I really didn’t have any business reading when I was ten years old, but I remember liking Robert Fulghum’s humor in All I Really Need to Know I Learned in Kindergarten and its sequels. It also probably helps that each story is short (less than five pages in my small paperback version). I may appreciate that even more as an adult. can cope with about anything. At some point in the writing process, someone had to source that arachni-fact. Maybe it was within the “S” volume of their encyclopedia set, or a thick book of trivia. Otherwise, it would require a trip to the library and a search for the right reference book. As I quickly type this post into my cloud-hosted blog software, I opened a new tab and got a similar answer in seconds. 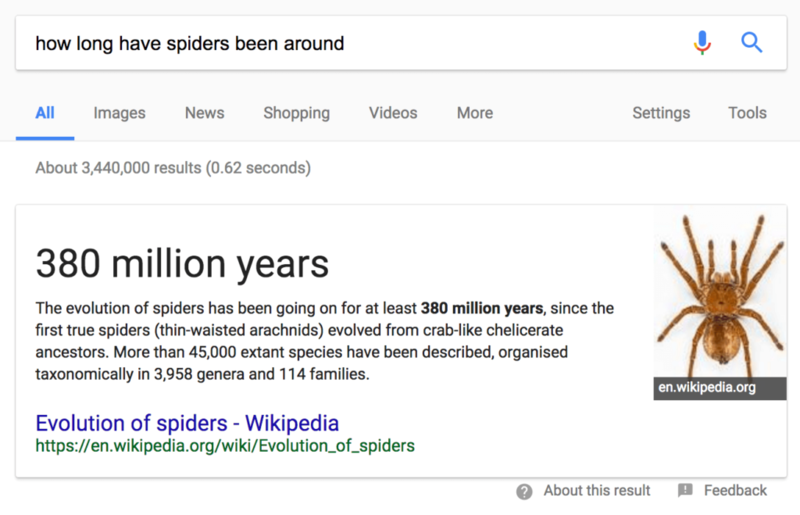 I didn’t even write out my complete question, because Google suggested this search based on many other curious humans. Drafts were likely typed and mailed to the publisher. By the early 90s, maybe he faxed edits. He was discovered when a printed copy of his story was sent home with school children, one of whom had a literary agent parent. Today, he’d likely write directly into a relatively inexpensive laptop, perhaps using writing software within a web browser. Feedback and edits could all happen within the same document, which could then be exported for publication. Or maybe he’d just have a blog, which, of course, he does.